Michael McFadyen's Scuba Diving - Sepik Reliance The town of Madang is often called the "prettiest town" in the whole Pacific. I must say that I agree with this description as it is very beautiful and ideally located on the shores of Madang Harbour, a harbour that comes close to Sydney Harbour in terms of size, protection and beauty. Numerous parks, lagoons and creeks are found in and around the town and there are plenty of trees that add to its appeal. To the north there are three other harbours, Nagada, Mililat and Sek Harbours. In reality, these are really just parts of the one, huge harbour protected from the open ocean (not that there is any real big seas) by a barrier reef and a number of small islands. The vast majority of the diving here is carried out in and around these harbours. One of these shipwrecks was the 40 metre long tug, Sepik Reliance. I have not yet been able to find any information about this vessel from the normal sources (eg Lloyds Register). 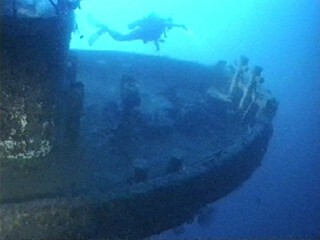 This scuttled wreck is located between Pig (Tab) Island and Massus Island. This is a deep dive, with the stern being about 43 metres and the section under the bow 56 metres. 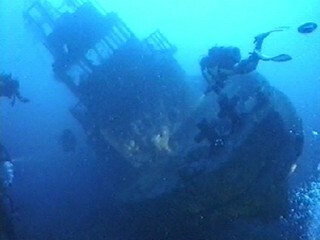 You can reach 60 metres easily while dropping to the seafloor to get a great perspective of the wreck. Like the other wrecks, the Reliance is intact, and presents a sensational sight as you descend from the reef where the dive boat anchored. The visibility was excellent, in the order of 40 metres or so, and the ocean surface clearly visible from 60 metres. 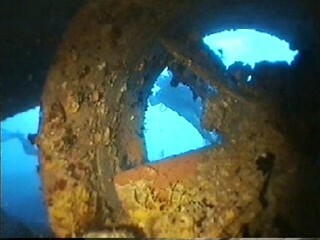 The first part of the wreck that you see is the stern. The line from the reef is attached to the deck. Drop down to the bottom below the stern and you will see the multi-directional prop which is very prominent. From the stern, swim straight to the bow along the hull and look at the silhouette of the tug as the bow sits well clear of the bottom, balanced by the heavier stern. From here, ascend to the bow deck and you can see the bridge and cabin area. Before examining this, enter the engine compartment (which is empty, the engine obviously having been removed prior to scuttling. After the engine room, enter the cabins and bridge area. This is quite interesting. I did 17 minutes on the wreck and had to do one minute at nine metres, four at six metres and ten at three minutes. This is easily done as you swim back to the shallow reef and spend your time watching the small reef fish. An excellent deep dive for the experienced diver. The minimum water temperature on these dives was 28°C, although in the shallows it was more like 30°C or more. The visibility ranged from 15 to 40 metres (we experienced a night of extreme rain and worst visibility was one and two days later). I stayed at Jais Aben Resort and used their dive operation. The service was excellent as was the quality of divemasters. I can certainly recommend both the resort and the dive operation. 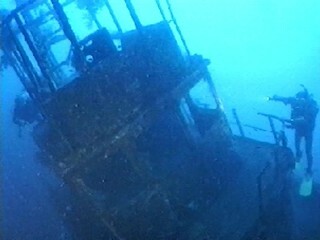 A short video of the wreck, filmed on 25 October 1996. Note: All photos from Hi8 video.